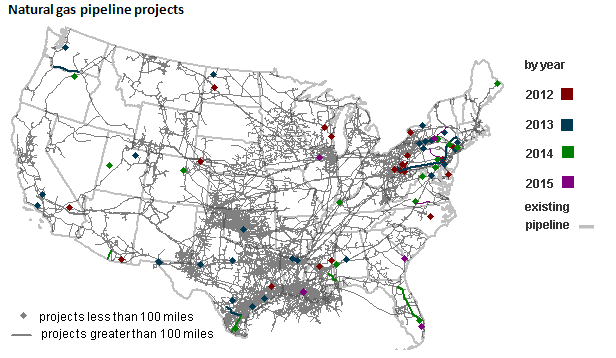 Source: U.S. Energy Information Administration, Pipeline projects. Notes: Capacity data exclude gathering and distribution lines. Data for 2013-15 are based on companies' announcements. U.S. natural gas pipeline capacity investment slowed in 2012 after several years of robust growth. Limited capacity additions were concentrated in the northeast United States, mainly focused on removing bottlenecks for fast-growing Marcellus shale gas production. More than half of new pipeline projects that entered commercial service in 2012 were in the Northeast (see map above). Excluding gathering, storage, and distribution lines, project sponsors in the United States added 4.5 billion cubic feet per day of new pipeline capacity and 367 miles of pipe totaling $1.8 billion in capital expenditures in 2012. Only 367 miles of new pipeline were added in 2012. Mileage-added, however, can be a misleading indicator of investment because pipelines can significantly boost capacity at key locations by uprating, or adding more horsepower to compressor stations, or by adding short pieces of pipe that nevertheless play a key role in removing bottlenecks on constrained parts of the grid. Total pipeline capacity additions in the United States were 4.5 Bcf in 2012. This was the lowest level of capacity added in 15 years. Capacity additions began growing after 2004 because of increased investment in pipelines to deliver shale gas production and to augment connections between liquefied natural gas (LNG) and storage facilities and the rest of the grid. Coming off big expansion years from 2008-11, pipeline industry expenditures in 2012 were comparatively smaller, totaling about $1.8 billion. Three projects — Appalachian Gateway Project, Sunrise Project, and TETCO TEAM 2012 Expansion Project— accounted for about $1.1 billion dollars, or around 60% of total capital expenditures in 2012. Even though natural gas pipeline capital expenditures were low in 2012 compared with the previous five-year average, they were not much lower than average capital expenditures from 1997-2006, or about $2.1 billion per year. 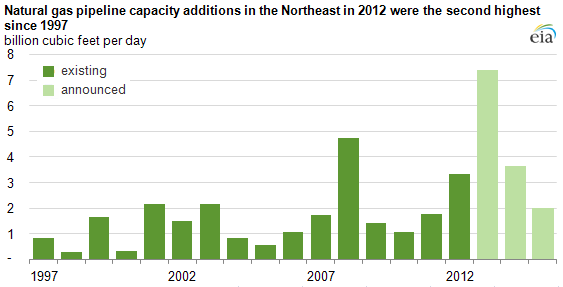 The industry added 3.2 Bcf/d of new capacity to the Northeast grid system in 2012, representing two-thirds of total capacity additions in the nation, and this was the second highest level of regional capacity additions since 1997. Together, the two largest projects—the Inergy Marc I Hub Line Project (partially completed) and the Appalachian Gateway Project—added about 1 Bcfd of new capacity to the Northeast. Capital expenditures were high in the Northeast in 2012 because of the amount of capacity and miles added in the region. Capital expenditures in the region were $1.5 billion, the second highest level since 1997. Two northeast projects—the Appalachian Gateway Project and Sunrise Project—together cost $900 million dollars, and equaled about 50% of total U.S. pipeline investment in 2012. Source: U.S. Energy Information Administration based on Natural Gas Intelligence. Despite material gains in pipeline capacity additions and shale-driven natural gas production in the United States since 2005, the greater New York metropolitan area (represented here by Transco Zone 6 NY) and especially New England markets still experience frequent constraints. These pipeline constraints coupled with declining natural gas production at Sable Island in Nova Scotia and limited liquefied natural gas deliveries into the northeast United States and Canada have contributed to much higher natural gas prices at certain trading points in the Northeast compared to the rest of the United States.